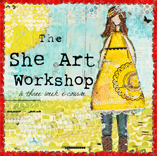 Sherry's Simple Blog: She-Art - the journey continues. Great work! It sounds like a lot of fun. Should be very interesting creating one out of a photo of yourself. Lovely She Art. Your words 'I don't think my craft room has ever been messier!' made me smile, sounds like mine. Interesting to see the different layers. Very very lovely, especially the dimensional dresses. I remember the songs, and your bag lady is very smart for a bag lady! Gorgeous work - love all the rich textures. The paper strips in the ruffle skirt are an ingenious idea! Still playing catch up. Had to go back for a look at your 1st week of She Art. I'm impressed. Looks fun. These two are so different and love the backgrounds you have put them on. Waiting with baited breath for week 3!!! Had a look at this class but sadly out of reach of my pocket at the moment. Hugs Mrs A. These are wonderful, I so want to do that class! Love these! So much amazing and interesting details! You are one big talent! Have a great evening! Sherry..these are Stunning...You sure look like you are having heaps of fun with this course...I'm soooo tempted to do this class! I do love your she art. The skirt with folded paper reminds me of some of the outfits you place on your paper art dolls. This technique fits right in with your style Sherry. Sherry, your paintings are wonderful, they compliment your clay face girls perfectly! I love these, Sherry! I checked out the class when you posted about it earlier, and it's on my list of fun things to do when my schedule clears. I want it even more now after seing these! They are both utterly gorgeous, Sherry!